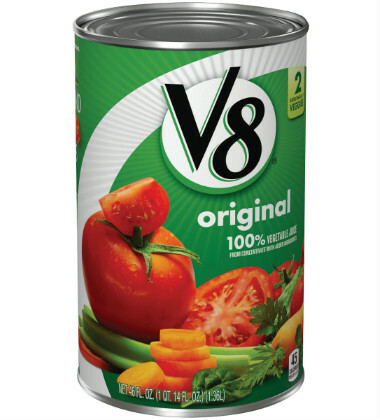 V8® 100% Vegetable Juice, chicken, peppers, onions and Cajun seasoning combine to deliver this simple, yet mouth-watering pasta dish. 1. Mix together flour, vegetable juice and Cajun seasoning until smooth. 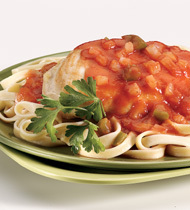 boneless, skinless chicken breast, 4 oz each	 96 oz. 24 ea. green pepper, chopped	 2 lb. 1 1/2 qt. 2. Heat oil in large skillet. Add chicken and cook until browned. Remove chicken. 3. Add pepper and onion and cook until tender-crisp. 4. Add flour mixture to large saucepot. Cook and stir until mixture boils and thickens. Return chicken to saucepot. Cover and simmer 10 minutes or until chicken is done. CCP: Heat until internal temperature is 165°F. or higher for 15 seconds. CCP: Hold at 140°F. or higher. Portion sauce using 6 oz. ladle (2/3 cup) over 1 cup (8 oz spoodle) fettuccine. green pepper	 1.5 lb. 1 1/2 qt.